VALLEY FAIR October 2018 • SHOPPING CENTER BUSINESS • 79 U nibail--Rodamco-Westfield has been a busy bee over the past few years, particularly in Califor- nia. Its focus on divesting non-core assets while reinvesting heavily in its flagship properties has led to renovation projects ranging from hundreds of millions to $1 billion each in Los Angeles' Canoga Park, Culver City and Century City neigh- borhoods. The next massive renovation in the pipeline for the shopping center owner and operator — which was created in May by the $15.7 billion acquisition of Westfield by Unibail-Rodamco — is West- field Valley Fair. This 1.5-million-square-foot shopping center is in the heart of Silicon Valley — literally — as it's nestled between Santa Clara and San Jose. While this market may not command the attention that dense metros like San Francisco or New York City might, Scot Vallee, vice president of development at newly renamed Uni- bail-Rodamco-Westfield, knows the firm must understand the power of the tech crowd if it's going to successfully navigate the future of retail. "If you're going to invest money, you invest it in your best markets," he notes. "With Silicon Valley, I'd challenge anyone to find a more growing, vibrant market. It creates more jobs, companies, patents and, because of this demographic, Valley Fair has always been a top-performing center." DOWNTOWN DREAMS Not being in New York City or in San Francisco might actually benefit Westfield Valley Fair as it provides more opportu- nities for this $1.1 billion renovation to embody exactly what the region's missing. 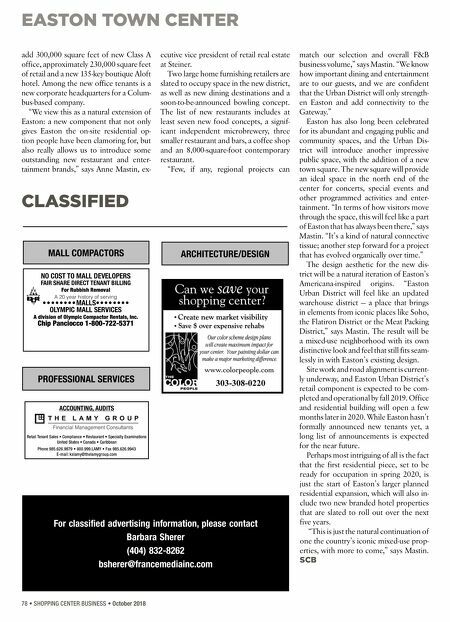 "There isn't a downtown here, so you often have to go somewhere for food, somewhere else for shopping and some- where else for live entertainment," Vallee continues. "This renovation is about max- imizing our space. We're trying to curate it more toward what the customer wants." This space maximization will add 700,000 square feet of new restaurant, retail and entertainment options, result- ing in about 100 new offerings when the entire project opens in late 2019. With no downtown to speak of, Ste- vens Creek Boulevard has become the convenient retail corridor for the area as it includes Westfield Valley Fair to its north and Federal Realty's Santana Row to its south. Part of Valley Fair's renova- tion plan will include improvements to the surrounding streets and intersections to make it more convenient for pedestri- ans and bikers to maneuver between the two. The new iteration will also include dockless LimeBikes and Lime electronic scooter rentals, 48 Electric Vehicle park- ing spots, and a new 2,000-space parking structure with digital navigation, a new lighting system and an app that can direct visitors to the nearest open spot. "Valley Fair used to have a huge park- ing garage in the front of the building," Vallee says. "In today's world, you'd never do that." The new structure not only doubles the amount of parking spaces at Valley Fair, but it also allowed Westfield to reuse that street-front visibility. The firm is installing a "bird's nest" cube inspired by an iconic piece of artwork from the 2008 Beijing Olympics that will pay homage to the ar- ea's large Asian demographic. The center may be easier to access and navigate, but visitors still need a reason to come. Valley Fair currently boasts 200 re- tailers that are open during construction, including everyone from Zara to Cartier, Nordstrom to Forever 21 and Coach to Balenciaga. The expansion will include a new flagship Bloomingdale's, a 10-screen Showplace ICON Cinema that boasts the largest movie screen in the South Bay, a new dining district, open-air promenades, outdoor lounges and more fashion hous- es added to Valley Fair's Luxury Collec- tion wing. The wing is already home to Prada, Giorgio Armani, Saint Laurent and Bottega Veneta, among others. 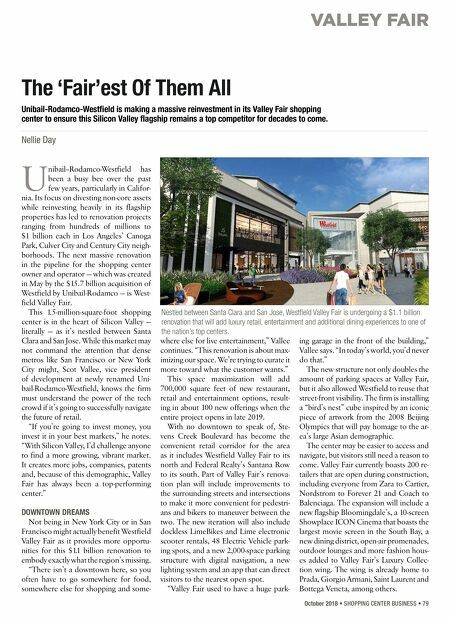 The 'Fair'est Of Them All Unibail-Rodamco-Westfield is making a massive reinvestment in its Valley Fair shopping center to ensure this Silicon Valley flagship remains a top competitor for decades to come. Nellie Day Nestled between Santa Clara and San Jose, Westfield Valley Fair is undergoing a $1.1 billion renovation that will add luxury retail, entertainment and additional dining experiences to one of the nation's top centers.